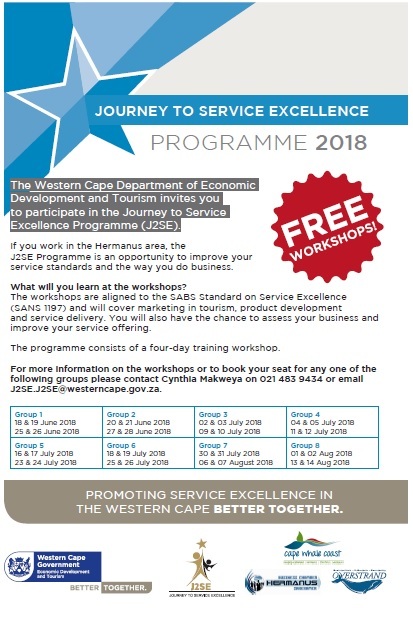 The Department of Economic Development and Tourism invites all businesses in Hermanus area across the Tourism value chain to participate in the Journey to Service Excellence programme. The Journey to Service Excellence Programme is a Tourism initiative and is in line with the National Tourism Sector Strategy (NTSS) that emphasises the importance of service excellence initiatives in the tourism value chain. The workshops will run from 18 June 2018 until 14 August 2018 across different Groups. Please see table below for group dates. It is a 4-day training workshop over two weeks. The training is for all businesses in Hermanus area. Develop a service excellence-orientated culture in your organisation. Workshops are free! Register Now! Download the Afrikaans Flyer here.